Are Prenuptial Agreements Legally Valid in Avondale? Prenuptial agreements are contracts that people enter into before they get married. They can set the terms for the division of assets in the event that the couple is divorced. While some people may think it cynical to be thinking about how to protect yourself in case of a divorce at the same time you are currently pledging your life-long love, others see these agreements as realistic and necessary to protect assets. Prenuptial agreements are typically recommended for those who have significantly more wealth than their intended spouse, those who own a business, those who expect a future windfall from an inheritance or business investment, and those who want to protect their family assets. However, anyone who wishes to get a prenuptial agreement can get one. The agreement can protect each individual’s assets, can protect each spouse from the other’s debts, and protect the inheritance of children from other marriages. A prenuptial agreement can also determine the future division of assets and clarify expectations for the marriage. Prenuptial agreements are legally valid in Avondale, as they are in all of Arizona if they meet the state’s requirements. The Arizona Uniform Premarital Agreement Act says that a prenuptial agreement is valid if it is drawn up as a formal, written document and is signed by both parties in front of a notary or attorney. However, a prenuptial agreement can’t contain just any terms. The agreement must be fair to both parties, and it cannot be “unconscionable,” such as asking one spouse to do legally or morally objectionable things to remain in the marriage, like steal or engage in prostitution. The agreement cannot be overly favorable to one party over the other, thereby leaving one spouse at a significant disadvantage upon divorce. It also cannot create “incentives” for divorce, such as creating a windfall for one party upon dissolution of the marriage. Of most importance, prenuptial agreements cannot include any plans for child custody or child support upon divorce. These are matters that will be determined based on the financial and emotional circumstances of each spouse at the time of the divorce. The court always rules in the best interests of the child, which are impossible to determine for an unknown future date. Should all of these requirements be met, the prenuptial agreement will go into effect on the date of the marriage, and it will be legally enforceable in Avondale and throughout Arizona. The only way it would not be enforced is if one party proved that the agreement was not entered into willingly, or if the document contained fraud. The document may also be dismissed if the marriage is proven not to be legally binding. It is important that both parties consult with an Arizona lawyer before signing a prenuptial agreement. A lawyer can advise individuals about their rights in the prenuptial agreement, and can help them recognize unfavorable terms. Those who do not have legal representation at the time of signing a prenuptial agreement may be able to contest the document later. 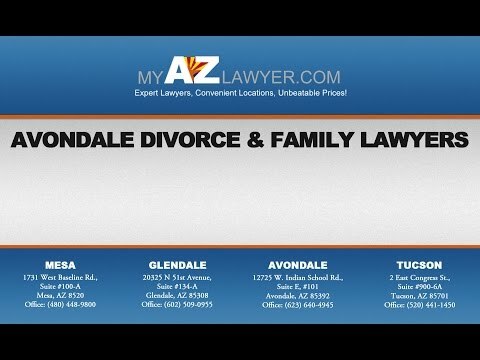 My AZ Lawyers provides the expert legal guidance to help Avondale residents create a prenuptial agreement that meets their needs and protects their rights. Our experienced Avondale attorneys can counsel you on what to include — and what not to include — in your prenuptial agreement to ensure that it protects you in the marriage, as well as meets the legal requirements of the state of Arizona. You can start your married life at ease, knowing that your assets are protected in case the worst were to happen. Call us today to schedule an initial consultation for your prenuptial agreement. What is a Pre-Nuptial Agreement and Do I Need One? To Prenup or not to Prenup in Mesa, AZ? Should Texting While Driving be Banned in AZ?